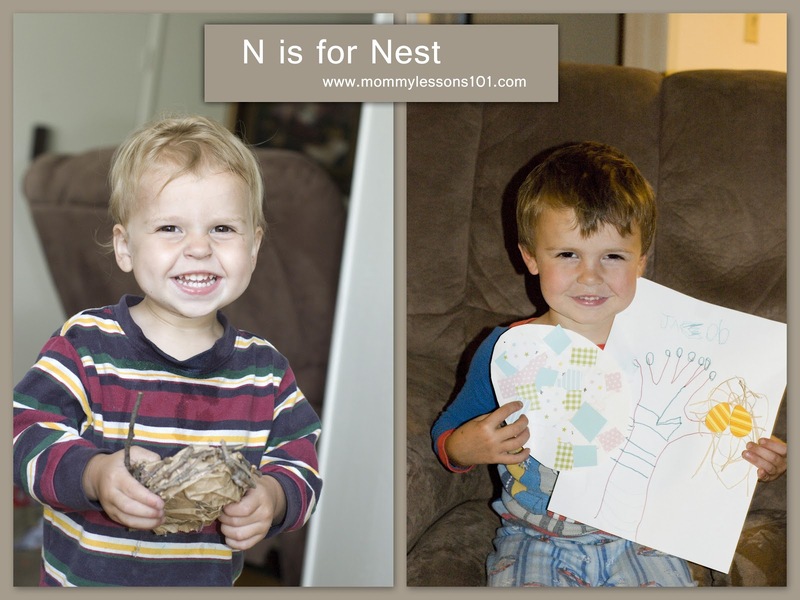 Last week, we enjoyed doing an "N is for Nest" theme. We focused on both nests and the different birds that build them. It was a perfect springtime unit. This was another unit that matched up with Confessions of a Homeschooler's printable themes, so we used her free printouts to trace the letter N and go on a letter N hunt. She also has some great letter review activities for the whole alphabet on her site. The Best Nest (Beginner Books(R)) and Are You My Mother? By P.D. Eastman. We enjoyed both of these classic early readers. In The Best Nest, the birds keep searching for a better place to build their nest and in the end realize that the home they had in the first place was the best. And a sweet little baby bird searches for his mother in Are You My Mother? This book was factual, and yet simple enough for even my two-year-old to enjoy sitting through. The illustrations are beautiful and the text is short and sweet. This book tells the legend of the Magpie's Nest and why different birds build different types of nest. We also read another version of this same story, The Best Nest by Doris L. Mueller. I preferred this version a bit, though they were both good. We loved the beautiful illustrations and sweet story in this little book about a baby Puffin. Afterwards we watched a video about real puffins (see below) and found that this book was quite accurate. I read the book The Boy Who Drew Birds: A Story of John James Audubon (Outstanding Science Trade Books for Students K-12) by Jacqueline Davies to my older son (it was too long for my two-year-old, but it is great for an older child). This book tells the story of John James Audubon. We used the one more/one less activity boards from the free Birds Preschool Pack here. I had my younger son just match the numbers directly while I challenged my older son to find the number one more or one less than what he rolled with a dice. We made trees with nests using the kids arms/hands. I traced each of their forearms and hands to represent the tree trunk and branches. Then, they drew leaves on the "trees." We added nests made from raffia and foam egg-shaped stickers. We also made mosaic eggs. I drew an egg shape on a piece of paper. My sons glued random bits of colorful paper on the egg, and then we cut the eggs out. Last year, we also made these brown paper bag and stick nests. My kids loved collecting the sticks for this project (you could probably add other items, too if you wanted). Glueing the sticks on the crumpled brown paper bag was tricky, so I had to help a lot with that. But they were very pleased with the finished project. They loved putting pretend eggs in their paper bag nests. We went to the Madrona Marsh--a nature preserve near our house. There we searched for birds. We saw a mother and father duck out with some adorable baby ducks. And we spotted a beautiful flock of egrets. Throughout our week at home we also searched for birds, and the boys were always excited when they saw birds in our yard or while we were on a walk. This website has some great chocolate cookie nests and this is another fun nest treat made with chow mein and marshmallows (like rice krispie treats). We also ate scrambled eggs during our N is for Nest week. We built our own blanket nest, and the kids pretended to be baby birds in a nest. They crouched down and pretended to be eggs. Then, they pretended to break out of their eggs and I pretended to teach them to fly and help them find food. My kids love playing pretend games. I let them take the lead in our make-believe games, but they love it when I am pretending right along with them. There are a lot of great songs to choose from about birds. Some of our favorite bird/nest songs were "Birds in the Tree", "In the Leafy Treetops", and "I Know a Chicken". If you want to see more of my related ideas, go check out my "N is for Nest" board on Pinterest!